Uncork your creativity and come Paint with Dali17. Experienced local artists Darls and Darls Fabrications lead you step by step through the process of unleashing your inner Salvador Dali. The two hour workshop includes, paint, canvas and supplies, and features live music! Space is limited! Reserve your ticket in advance by calling (831) 372-2608. 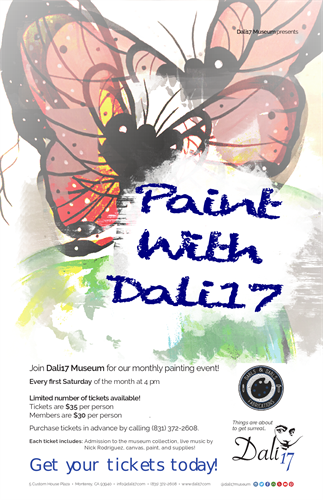 $35 per person OR $30 per person for Dali17 Members.